The Florida Council on Compulsive Gambling (FCCG) joins the National Council on Problem Gambling and the International Centre for Youth Gambling Problems and High-Risk Behaviors at McGill University in raising awareness regarding the risks of underage lottery play during the holiday season. 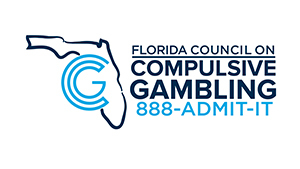 Today, the Florida Council on Compulsive Gambling is raising awareness about responsible gambling and gifting during the holidays as part of the National Council on Problem Gambling’s Holiday Lottery Responsible Gaming Campaign. Although it may seem fun and innocent, gifting scratch-off or other lottery tickets to minors carries serious risks. “Did you know that a study among Florida Middle and High School students revealed more than half (55%) reported participating in some type of gambling activity, and 24% of those were already classified as medium- to high-risk gamblers?3 This study also recognized strong correlations between youth gambling and problematic behavior in school such as truancy, poor grades, disorderly conduct, and substance use. The adolescent brain is also vulnerable specifically when it comes to decision making, impulsivity, and emotional reactivity, which can hinder their ability to make a rational and informed decision about whether to gamble,” said Jennifer Kruse, the FCCG’s Executive Director. “Even through the cheer of the holiday season, parents and others need to be aware of the problem gambling risks inherent in giving lottery tickets to children. Alternative stocking stuffers are in no short supply, and this simple responsible gambling choice just makes sense for the holiday season,” concluded Kruse. 1 Kundu, Priya V et al. “Gambling-Related Attitudes and Behaviors in Adolescents Having Received Instant (Scratch) Lottery Tickets as Gifts” Journal of Adolescent Health: Official publication of the Society for Adolescent Medicine vol. 52,4 (2013): 456-64. 2 Derevensky, Jeffrey L, and Rina Gupta. Adolescents with Gambling Problems: From Research to Treatment. Journal of Gambling Studies, 2000, link.springer.com/article/10.1023/A:1009493200768. 3 Lieberman, Louis, and Mary Cuadrado. Gambling among Florida Middle and High School Students. The Florida Council on Compulsive Gambling, Inc., 2006, Gambling among Florida Middle and High School Students, www.gamblinghelp.org/assets/research_pdfs/Gambling_Among_Florida_Middle_and_High_School_Students.pdf.